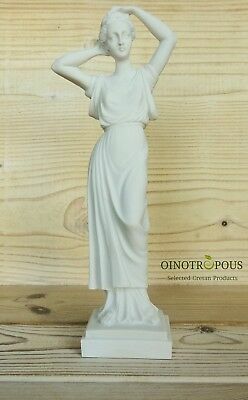 Seller: sandsoftimedc_com (425) 100%, Location: Washington, District Of Columbia, Ships to: Worldwide, Item: 152899608035 The graceful figure shown standing with weight on her left leg, her right slightly bent and placed slightly to the side, her slender form dressed in a long thin chiton, the fine drapery carefully modeled to reveal the form of her body beneath, her himation artfully drapes over her left shoulder and under her right breast, to be clasped at the front with her right hand that rests near her waist, her left arm lies straight by her side. Her head is small in relation to her body, in accordance with the canons of the fourth century sculptor Lysippus, her serene oval face with full lips, classical nose, and graceful swan neck, her hair dressed in a melon coiffure swept back over the ears and bound in a chignon at the back. For similar examples see: R.A. Higgins, "Greek Terracottas", pages 101-104 and plates 42-45 especially 43C and 43D and Chesterman, J. "Classical Terracotta Figures" (1974) pages 58 - 63. 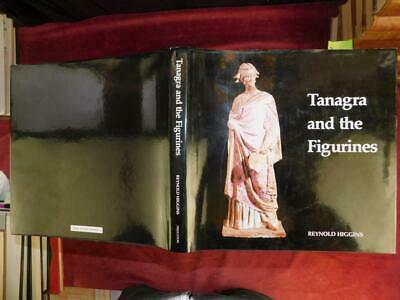 Chesterman writes "Tanagras are the flower of all terracottas, inasmuch as they are the most sought after of all periods and styles. The reason is not far to seek. They portray graceful girls or youths of great physical beauty standing or sitting in statuesque poses. The repertoire also includes woman playing knuckle bone (a popular Hellenistic game), Eros as a chubby infant and, occasionally, grotesques. Their conception was undoubtedly influenced by Praxiteles who was active in Athens between c. 370-330 BC and who had a studio also at Thespiae in Boeotia". Dimensions: Height: 6.10 inches (15.5 cm) Condition: The figure is complete with professional rejoining of the head to the body, with rectangular firing vent at the back and open base. Much of the original white slip remains together with touches of original blue and red pigment in places. Quite lovely. Provenance: Acquired by Harry and Gertrude Lander, New Haven CT between 1950 and 1965 while traveling overseas and then by decent. With early date label attached to the back. Popularity - 843 views, 1.9 views per day, 442 days on eBay. Super high amount of views. 0 sold, 1 available. 843 views, 1.9 views per day, 442 days on eBay. Super high amount of views. 0 sold, 1 available.